A 2,700-year-old stash of whole marijuana plants was uncovered in an ancient tomb in northwest China. If marijuana aged like wine, the rare “artifact” may be one of the most wanted objects for all the pot smokers around the world, but according to the researchers, the weed had decomposed over the years and no one would feel any effects if they smoked it today. A team of archaeologists, led by Hongen Jiang from the University of the Chinese Academy of Sciences, found nearly two pounds of a dried plant that was still untouched after “hiding” for thousands of years underground. 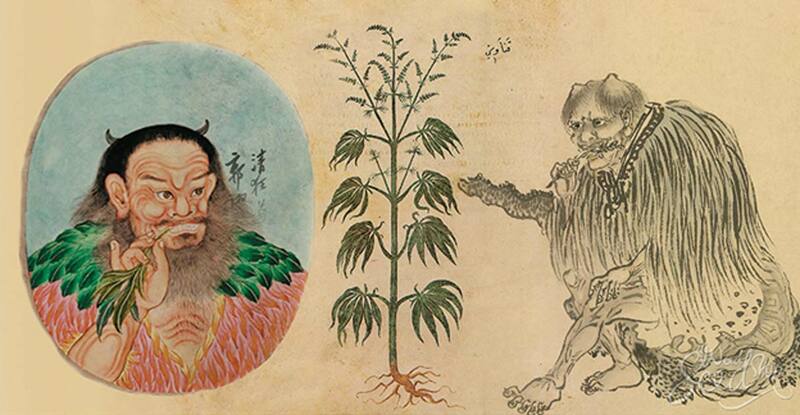 According to a study published in 2008 in the Journal of Experimental Botany , the green plant material found inside a 2,700-year-old grave from the Yanghai Tombs excavated in the Gobi Desert, turned out to be the oldest marijuana in the world. Interestingly, according to the archaeologists, the plant was placed near the head of a blue-eyed, 35-year-old Caucasian shaman among other objects like bridles and a harp to be used in the afterlife. The fact that the plant had a chemical known for psychoactive properties called tetrahydrocannabinolic acid synthase, or THC, made scientists speculate that the man and his community most likely used it for medicinal and recreational purposes. According to professor Dr. Ethan B. Russo of the Chinese Academy of Sciences Institute of Botany, someone had picked out all the parts of the plant that are less psychoactive before placing it in the grave, therefore the dead man probably didn’t grow his hemp merely to make clothes. Initially, the researchers thought the dried weed was coriander. After spending ten months getting the cannabis from the tomb in China to a secret lab in England, the team of researchers realized they were wrong. They put the stash through “microscopic botanical analysis”, including carbon dating and genetic analysis, and discovered the herb was really pot. The exceedingly dry conditions and alkaline soil acted as preservatives, making it easier for scientists to attentively investigate the stash, which still looked green though it had lost its characteristic odor. "To our knowledge, these investigations provide the oldest documentation of cannabis as a pharmacologically active agent," Dr. Ethan B. Russo wrote in the published paper. Despite the tomb stash found in China being the oldest found so far, this isn’t the first time that archaeologists have discovered remains of the notorious plant. Marijuana, also known as cannabis or pot, has a long history of human use. The majority of ancient civilizations, however, didn’t grow the plant to get high as people usually do nowadays – they used it as herbal medicine. Remnants of cannabis have been found in ancient Egypt and other sites. The substance has also been referred to by authors such as the famous Greek historian Herodotus, who described the Scythians inhaling the smoke from smoldering cannabis seeds and flowers to get high. The cannabis or hemp plant originally evolved in Central Asia before people introduced it into Africa, Europe, and eventually the Americas. Hemp fiber was used to make clothing, paper, sails and rope, and its seeds were used as food. Because it’s a fast-growing plant and very easy to cultivate (plus it has many uses), hemp was widely grown throughout colonial America and at Spanish missions in the Southwest. In the early 1600s, Virginia, Massachusetts, and Connecticut colonies required farmers to grow hemp. These early hemp plants had very low levels of tetrahydrocannabinol (THC), the chemical responsible for marijuana’s mind-altering effects. However, it is believed that that some ancient cultures knew about the psychoactive properties of the cannabis plant and may have cultivated some varieties to produce higher levels of THC for use in religious ceremonies or healing practice. The 2,700-year-old stash of marijuana found in China appears to strengthen the aforementioned belief, as it was found to have a relatively high content of THC - even though the sample was too old to determine an accurate percentage. Additionally, scientists could not determine whether the cannabis was smoked or ingested, as archaeologists weren’t able to find any pipes or other clues in the tomb of the shaman. However, this shouldn’t surprise anyone. Ancient people inhaled cannabis; they just didn't use pipes until the advent of tobacco. It’s very possible that the earliest inhalers of cannabis smoke did so by accident. Perhaps when throwing it on their campfire they found the fragrance pleasing to the nose and then discovered its effects on the mind. So, what do we really learn from this 2,700-year-old rare find? Some of our ancestors – regardless of geographical location – knew more than we may think about the effects of inhaling pot. And probably some of them loved getting high, just like some of their descendants still do today!